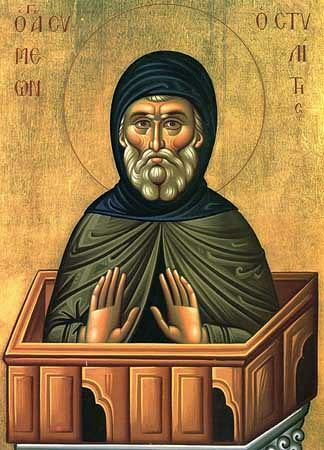 The Monk Simeon the Stylite was born in the Cappadocian village of Sisan in the Christian family of Susotian and Martha. At 13 years of age he began to tend his father's flock of sheep. To this his first obedience he concerned himself attentively and with love. One time, having heard in church the Gospel commands of the Beatitudes, he was struck by their profundity. Not trusting to his own immature judgement, he turned therefore with his questions to an experienced elder. The elder readily explained to the lad the meaning of what he had heard and it strengthened in him finally the resolve to follow the Gospel path. Instead of heading homewards, Simeon set off to the nearest monastery and, after tears of entreaty, he was accepted after a week into the number of the brethren. When Simeon became age 18, he took monastic vows and devoted himself to feats of the strictest abstinence and of unceasing prayer. His zealousness – beyond strength for the other monastic brethren – so alarmed the hegumen (abbot) that he suggested to the monk that he either moderate his ascetic deeds or leave the monastery. The Monk Simeon thereupon withdrew from the monastery and settled himself by day upon a very high column, where he was able to carry out his austere vows unhindered. After some time, Angels appeared in a dream vision to the hegumen, which commanded him to bring back Simeon to the monastery. The monk however did not long remain at the monastery. After a short while he settled into a stony cave, situated not far from the village of Galanissa, and he dwelt there for three years, all the while perfecting himself in monastic feats. One time, he decided to spent the entire Forty-day Great Lent without food and drink. With the help of God, the monk endured this strict fast. From that time he always completely refrained during the entire period of the Great Lent even from bread and water – twenty days he prayed while standing, and twenty days while sitting – so as not to permit the corporeal powers to relax. A whole crowd of people began to throng to the place of his efforts, wanting to receive healing from sickness and to hear a word of Christian edification. Shunning worldly glory and striving again to find his lost solitude, the monk chose a yet unknown mode of asceticism. He went up a pillar 4 meters in height and settled upon it in a little cell, devoting himself to intense prayer and fasting. Reports about the Monk Simeon reached the highest church hierarchy and the imperial court. The Antioch Patriarch Domninos II ((441-448) visited the monk, made Divine Liturgy on the pillar and communed the ascetic with the Holy Mysteries. Fathers pursuing asceticism in the wilderness all heard about the Monk Simeon, who had chosen such a difficult form of ascetic striving. Wanting to test the new ascetic and determine whether his extreme ascetic feats were pleasing to God, they dispatched messengers to him, who in the name of these desert fathers were to bid the Monk Simeon to come down from the pillar. In the case of disobedience they were to forcibly drag him to the ground. But if he offered obedience, they were entrusted in the name of the desert fathers to bless his continued ascetic deeds. The monk displayed complete obedience and deep Christian humility. The Monk Simeon was brought to endure many temptations, and he invariably gained the victory over them – relying not on his own weak powers, but on the Lord Himself, Who always came to him in help. The monk gradually increased the height of the pillar on which he stood. His final pillar was 40 cubits in height. Around him was raised a double wall, which hindered the unruly crowd of people from coming too close and disturbing his prayerful concentration. Women in general were not permitted beyond the fence. In this the monk did not make an exception even for his own mother, who after long and unsuccessful searchings finally succeeded in finding her lost son. Not having gained a farewell, she thus died, nestled up to the fence encircling the pillar. The monk thereupon asked that her coffin be brought to him; he reverently bid farewell to his dead mother – and her dead face then brightened up with a blissful smile. The Monk Simeon spent 80 years in arduous monastic feats – 47 years of which he stood upon the pillar. God granted him to accomplish in such unusual conditions an indeed apostolic service – many pagans accepted Baptism, struck by the moral staunchness and bodily toughness which the Lord bestowed upon His servant.